The river town of Hood River offers a number of attractions in addition to outdoor recreation. Options include a scenic railroad excursion, a museum of carousel art, a brewpub, and winery tours. 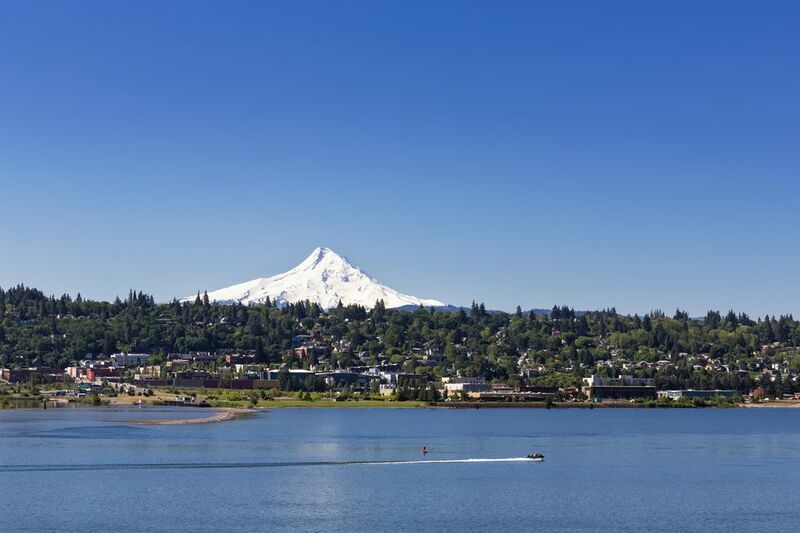 Hop the train in Hood River and take in the foothill panoramas of majestic Mt. Hood. You may choose from morning or afternoon sightseeing excursions, or weekend dinner and brunch trains. Dedicated to the preservation, restoration, and exhibition of antique carousels, this museum displays over 125 animals from around the world. Related carousel art, chariots, a working 1917 Wurlitzer Band Organ, and an antique steam engine are also exhibited. Located in the historic Diamond Fruit Cannery building overlooking the Columbia River, Full Sail's Hood River Brewery offers tours. Take advantage of the opportunity to sample some of Full Sail's acclaimed ales and seasonal brews. Enjoy Oregon's Columbia River Appellations, including Cabernet Sauvignon, Merlot, and Semillon varietals. Winery tours and tastings are available seasonally. Between the Columbia River Gorge wind and its currents, Hood River is heaven for windsurfers. Fans come from around the world to partake of the perfect conditions, or to watch the windsurfing and kite sailing action. This directory of resources will help you find new, used, and rental equipment, river guides, lessons, and other Columbia River Gorge windsurfing information. One of the largest windsurfing organizations in the United States, CGWA strives to improve conditions and access for wind enthusiasts in the Gorge. They also sponsor a number of meetings, lessons, and events, including the US Windsurfing National Championships in August. Waterfalls, running waters, and river, mountain, and forest views draw hikers of every skill level to the Columbia River Gorge and Mt. Hood area. These trail maps and descriptions will help you choose the right hike. Maps and descriptions for dozens of hiking and multi-sport trails on this Forest Service preserve. With the construction of Interstate 84 in the 1950's, many sections of the old highway were abandoned. Sections have been turned into trails for hikers and bikers, with more being restored for use each year. The Chinook Trail Association, a citizen organization, is working to creating a continuous 300-mile loop trail that covers both the Oregon and Washington sides of the Gorge. For now the several hiking trails in the Chinook Trails system are unconnected. The long-term goal is to connect existing trail segments with new trail construction. There are many roads and trails on this USDA Forest Service land, offering access to old-growth forests, majestic river viewpoints, and varied terrain. The Oregon Department of Transportation (ODOT) has provided this detailed set of maps for bikers. The map can be viewed in PDF format, or a hard-copy can be obtained from local bike shops or by contacting ODOT. The Columbia River Gorge offers a wealth of scenic wonders - river views, waterfalls and wildflowers, basalt cliffs, snowcapped mountain peaks, and verdant forests and farmland. A scenic drive is a great way to enjoy all this beauty. Head out from Hood River along Interstate 84 on the Oregon side of the Columbia River, or State Highway 14 on the Washington side; you'll be surrounded by scenery on all sides. This amazing driving tour winds from Troutdale to The Dalles. Popular stops include Vista House, Bridal Veil Falls, and Multnomah Falls. The farms, vineyards, and orchards of this fertile region offer beautiful views and amusing stops throughout the growing season. The spring bloom on the orchard trees entices many visitors to the area; fresh produce stands and markets keep them coming until harvest's end. Built as a monument to Oregon's pioneers, the historic Vista House is one of the Gorge's most photographed destinations. It lies on a bluff overlooking the Columbia River, near the town of Corbett. The many spectacular waterfalls along the Columbia River Gorge include Latourell Falls, Bridal Veil Falls, Wahkeena Falls, and Multnomah Falls. The town of Hood River offers a range of accommodations, from grand full-service hotels to value lodging. New condominiums adjacent to the historic inn, both perched on a wooded hillside overlooking the Columbia River Gorge. Charming European-style lodging with river views, fine dining, and meeting facilities. On the National Register of Historic Places, this hotel is often recommended as one of the Northwest's top romantic getaways. The Best Western Hood River Inn offers convenient access to gorge and Mt. Hood recreation and attractions. The inn's "Riverside Grill" features a range of interesting cuisine. Hood River is located at Exit #63 on Interstate 84. It is approximately 60 miles east of Portland, Oregon. It is 230 miles from Seattle. Hood River Airport is available for private and charter flights. There is also an airfield in The Dalles and one in Troutdale. Portland International Airport is the nearest major airport with scheduled passenger service.